Submitted by Jacob Surratt - "Chapin-The First 125 Years"
Chapin (population 592) is located in eastern Morgan County in western Illinois. U.S. Route 67 is the main roadway to and from Chapin and connects it to Jacksonville located 10 miles to the east of Chapin. The Norfolk & Western Railroad also travels through Chapin. Chapin was founded in 1858 by Lyman and Horace Chapin. A wonderful history of the Chapin school system was recorded in a 125th Anniversary book created in 1983. The name of the book is "Chapin - The First 125 Years." Copies of the pages involving the school system were submitted by Jacob Surratt. The pages are shown below. The high school for the Triopia School District is located near Concord. 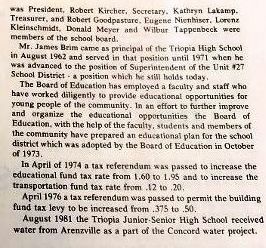 The name of "Triopia" was suggested by Ruth Hierman, a teacher at Arenzville. The Tri was for the 3 schools that consolidated. The "opia" was in the hope that the effort would result in utopia. Hence, "Triopia". We do know that the Chapin school building no longer exists. The main school building was torn down, there was an additional building built that housed the Kindergarten, 1st grade, and lunchroom. 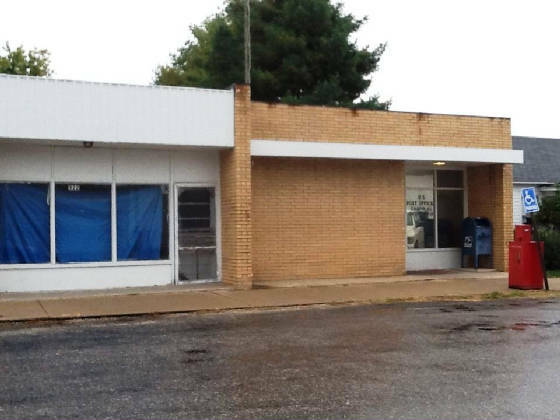 That portion was not torn down and it now houses the gas station/convenience store that remains. 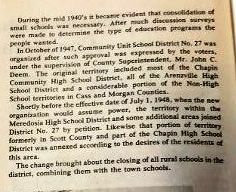 According to former student Robert Stuller, who attended Chapin HS his sophomore year only (1949-50), the Principal that year was Mr. Keyhart. He further recalls the coach being Mr. Blakeman and the Agricultural teacher Mr. Fox. "I completed all 12 grades at Chapin, I remember that before the new high scool was completed the HS played basketball upstairs over a grocery store and harness shop which my father later had a carpenter shop and built the building to rent to the GSA that is the present day post office. "The room that was used as a lunch room and other functions was located at what was the grade school a little was from the HS. The high school was at one time called the Charles S. French HS as the property and building was donated by the French family . "The first school building in the Chapin area was held in a log cabin building. 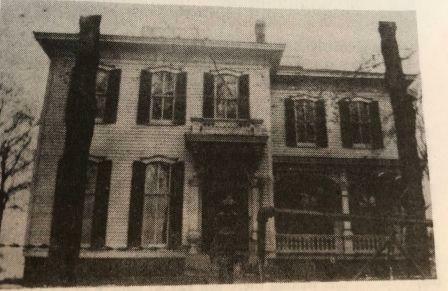 The article did not list the time period that it was occupied as a school, but did list Libbie Hann as a teacher. 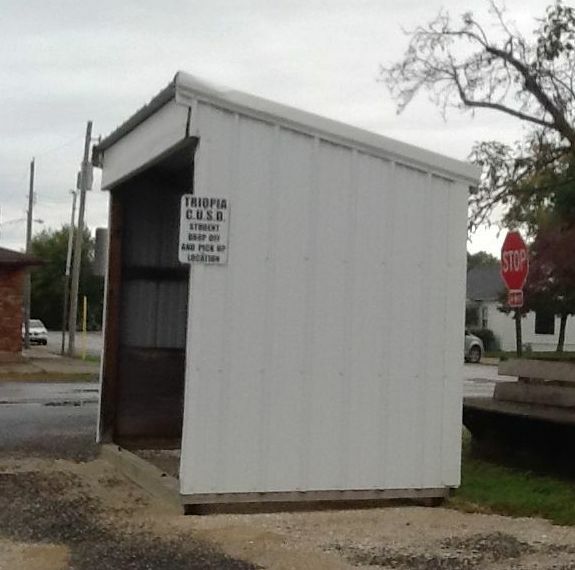 "The first regular district school erected was a two-room building built in 1872. 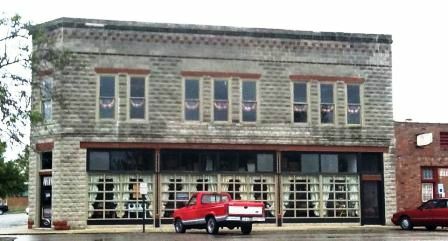 This building was succeeded by a brick schoolhouse constructed in 1894, built after the passing of a $5000 bond in Chapin. This school burned down in 1921. 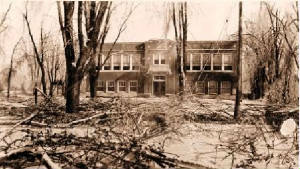 "The next grade school, also brick, was completed in November of 1921. 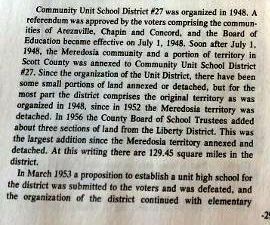 It was decided at this time the town possessed a need for a building for grades 9-12. The high school was held in a house provided by Charles S French ( it was a big house which I remember, but did not attend school there). This building served as the high school through 1937. 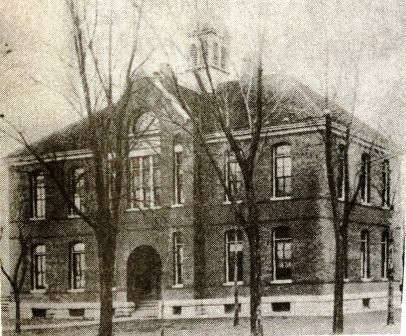 "The new brick school building (which I provided the picture of) was completed and opened in 1938 as the Chapin High School. It served in this capacity until 1959. 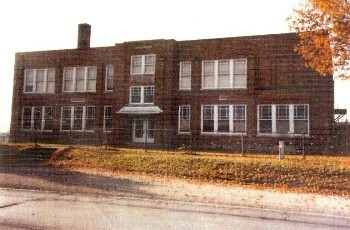 It continued to be utilized as a grade school after the consolidation until 1969. "My sister and I have the year books for the years we went there. I graduated in '48 and after trying to figure out what I wanted to do with my life I went in the Navy Seabees for 27 1/2 years and after retirement now live in Manchaca, Tx. (Austin area)." If you have any further memories of Chapin High School please contact us at ihsgdwebsite@comcast.net. School Fight Song: "Chapin Loyalty"
Victory from you Chapin High! Chapin High School won a District title in boys basketball. Football was also offered at the school. The boys probably competed in baseball and track as well. The greatest of success at Chapin High School as listed on the IHSA web site (www.ihsa.org) came not in athletics, but from the English Department. The Drama Team of 1958 faired extremely well and is written about below. Chapin High School boys basketball won one IHSA District title in 1953. There were probably many great seasons at CHS however the records are not listed on the IHSA web site. If you can add to this information please e-mail us. The year of the District Championship is listed; however, the team record and coaches' name are not available. Coach Paul Blakeman served as athletic director and coach from at least 1952 through 1957. In 1958, Glen Ambler became Coach of athletics until 1960. Some basketball scores involving Chapin HS in the IHSA state tournament were located on a website titled "Illinois Postseason Basketball Scores." These scores are listed below. 1936-37 through 1947-48 Postseason scores, records, and coach's names needed. 1956-57 Postseason scores, records, and coach's name needed. 1957-58 Postseason scores, records, and coach's name needed. *Final game for Chapin High School. Tom Sikorski forwarded the following information on the Chapin High School Bearcats' football successes. The Chapion High Drama Team had one incredible showing at the State Competition. The team of 1957-58 placed Fourth overall in the State Competition in a one class system!! The final team standings of that year are listed however the coaches name and team members names are not available. Placed Fourth Overall at the State Meet! "I am Barbara Woodward Griffin, raised in Chapin from my birth by Walter and Elsie Woodward, following the death of my mother, at my birth in Downers Grove, Illinois on January 19, 1924. 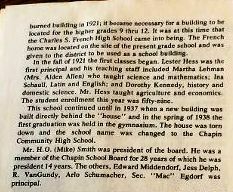 I lived in Chapin until graduating from High School 1941 in the first class to graduate then at the newly constructed building. By then the Chapin students had the other Freshmen added from the surrounding area, and ended up with just 24 students in our class at 1941. To date today, of November 2016 there only 2 of us left as far as I know. Mary Frances Sanderson Fortado is still living in Jacksonville. I talked to her often yet. But we lost our dear friend, Thelma Brewer Gray died this spring of 2016 . She lived most of her life in Sacramento, Ca and her husband, Gene Gray passed away very young there after returning from the military. We have no recent news of the other two left, Paul Nash and George Perbix. At almost 93 years of age, I have been blessed by having a total memory of many years back to the time I was only 3 in Chapin. Later, My brother, Odell Woodward ran a grocery store there, was active in many things like the Fire Department. My Grandfather Frank Blair, who was the father of my deceased mother, Blanche Blair, ran a small paint and paper store in Chapin for years. My sister, Janice Woodward was raised my our Uncle Opal Blair, Odell was raised by his grandparents, Frank and Georgia Blair. We started our Freshmen year in the Charles French home in 1937, in the home donated for a school years before. One of my favorite memories was that Halloween, some of the boys, managed somehow to get a small cow or calf up to a flat roof on the second floor. That was always the way we celebrated Halloweens then by playing tricks on people. I now live in New Braunfels, Texas since 1998 and married Larry Griffin in 1979. My two oldest sons, James and Ric Hetchler, from my first marriage have lived in this area for the past several years. We moved here and like it very much even tho, this area is mushrooming in growth really fast. My youngest son, Mark Andrew Davis, living now in Phoenix is into Genealogy for years and does send pictures, etc , to the Chapin Historical website now and then. I have been in the computer world, working on the forerunner of computers in Data Computing in 1958, so am actively watching news but had been neglecting to read the Chapin, Illinois website lately. I am sure there are not many left in my age group, but was interested in one entry from someone, who said they were living in Texas then about 50 miles from me in New Braunfels, Texas. If they are still living I would like to find out who it was as he would be about 7 years younger than me now. " 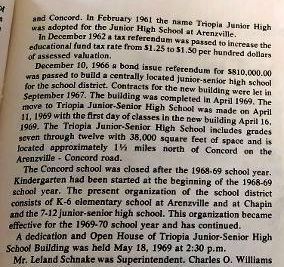 "In 1960, we became Triopia but still maintained separate schools, as the new school just north of Concord was not yet built. Busing between the schools was done for all althetics and fine arts events. Paul Blakeman became principal of Triopia High School and Chapin High School Senior Sponsor, Farrell McGinnis was named Principal of Arenzville High School and Arenzville High School Senior Sponsor. Glen Ambler remained head coach of Basketball and Donald Kemp coached football. Coach Kemp, who continued to coach football for many years at Triopia, achieved the 3rd highest winning percentage in high school football in the state of Illinois. Coach Kemp passed away last week in Iowa after several bouts of illness." "I graduated from there in June 1955. My years there were 1951-2 through 1954-5. In 1951-2, the principal was Wilfred E. Rice, and our Coach was Donald Constantz. Enrollment was 88 students (40 boys, 48 girls). Our sports that year was in a down year. We played 6-man FOOTBALL, record was 2-4-1.In Basketball we were 8-16, and in baseball, 4-9. "In 1952-53, Mr Rice was still principal and Paul Blakeman coach. There was 86 students (44 boys, 42 girls). In Football we were 3C Conference champs Record 6-1 (best record ever since starting the sport). The team averaged 37.7 ppg, and lost only to Chandlerville by a score of 36-44. Mel Engelbrecht and Ronald Smith were all-conference players. In Basketball, we had a fine team. The record was 17-11. That was the year we won the DISTRICT Tourney by beating ROUTT 57-41. We went on to the Jacksonville Regional where after beating both VIRGINIA & I.S.D, we lost to Jacksonville (a much larger school) by a score of 37-82. Jacksonville went on to state finals where they lost to Pinckneyville 58-57 in the quarterfinals. "In year 1953-54. Paul Blakeman is now principal, and Bob Jones the coach. Enrollment is 87 students (43 boys, 44 girls) Football record was 3-4. In basketball we had a fine team (19-7). We tied for 1st place with Arenzville in P.M.B.C. conference. We won the P.M.B.C tourney for the 1st time in 14 years beating BLUFFS for the Championship. However, we lost to ROUTT in the DISTRICT tourney. We were 2nd. "In 1954-5, my final year, the principal was still Paul Blakeman, and the coach Tom Carmody. Enrollment was 75 students (39 boys, 36 girls). Record in football was 2-3-1. In Basketball, we had another fine year (17-9) tied for the conference title for the 2nd year in a roll (BLUFFS). We ended up 3rd in the P.M.B.C tourney. In the District tourney, we lost to BLUFFS. Our Baseball record for the year was 2-6. "P.M.B.C stands for the 4 counties that the teams in our conference were from: PIKE, MORGAN, BROWN, & CASS." "My mother Carmellitta Thompson (Moore) and her family were born and raised in Chapin, IL. I know that she graduated from Chapin High School from the building on the Highway 104 (now 104/67), pictured on your website, in 1939. I used to have a picture of her in her senior play. The stage looked large and I remember the black curtains with a huge white "C" at the top in the middle. They looked new in the picture. "I remember my parents talking about the consolidation of Triopia but I am not sure of my age when this was going on. I have two cousins that would have graduated [Darlene (Thompson) Becker] in '62 or '63 and [Delores (Thompson) Hoots] in '66-'68. I also remember the Chapin grade school was just across the field from the high school on the north end of Poplar street. My aunt on my dads side taught grade school classes at the Old Chapin high school. 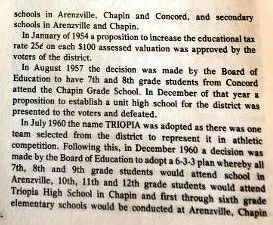 "It was my memory that after Triopia High was built, the parents in Chapin wanted the high school converted to a grade school to avoid bussing the small children. I spent a lot of time at my Grandma's in Chapin in the late 50's, 60's, and early 70's." "I read with interest your webpage on the old Green Meadow School in Chapin, Illinois. I am attaching a letter that was written by my great-grandmother, Mary Elizabeth Paschal, to her brother Asa Newton Paschal while Asa was fighting for the Union in the Civil War. I can also scan the original and send it to you if you are interested. "Mary taught at the Green Meadow School, as she mentions in this letter. She later married Jonathon Hobson. They are buried in the Chapin Cemetery. Their first daughter, Clara was my grandmother. She married Charles Parker Fulton, who lived in Chapin in the 1870s & '80s. "When I visited Chapin about ten years ago (I live in Oregon) I found a tiny old school on a wooded lot just outside of town. Is this where Green Meadow School was located?" The letter referred to by Joe is printed below in its entirety. Think about this.....it was written in the 1860s from a school teacher to her brother who was fighting in the Civil War!! With pleassure I sit down to write to you. It has been some time since I have heard from you. The last letter Will received. In the first place I will tell you I am at Sister Margarets this evening in good health. Sister is better, but is not able to do any work yet. She washes the dishes sometimes and that is all of the housework. The rest of the family is well. I left home two weeks ago yesterday. They were all well then. I have not heard directoly from there since. I am teaching school at the Green Meadow School House near here, which commenced the 11th of April. I got along very well last week and hope to continue in so doing. I am to get $20 a month. I went home and stayed some over two weeks. Time flew rapidly and I had a pleasant time, but home is not like it was when my own dear mother was there, far from it. I hated to come here so far away from home on Tommy's account. He will miss me most. Will has another to keep him company so that he does not miss me so much. My leaving home to teach this time was so far different from what it was before, I could not help but think of it. Mother went out of the house with me and you leaned on the gate post and told me not to cry. Now, no mother, and you so far away. Rachel and the children were well when I came away. Thaniel was complaining of a sore knee, which hurt him considerable. I received a letter from Cousin Joseph Street. He has got home. He did not say whether he had been discharged or not but I suppose he has. The relation were all tolerable well except Uncle Bland. He was very sick. The relation in this part of the state are all well as far as I know. Josh Crow was up to Beardstown this spring on a visit with his wife and child. I did not see them as I was up here when they were here, also James Crow has been back, but I did not see him either. This is Sunday evening. I have stayed in the house almost all day. This is rather a lonesome place on Sunday, there being no meeting of Sunday School here and the cars not running makes it more so. I can see soldiers on the cars every day, but the one I would rather see than any other is yourself. would like to know if you have ever heard from Mr. Richards again, I once heard he was in prison at Richmond but I have never heard anything since. Please direct to Chapin, Morgan Co., Ills, when you write. Tell me all the news in general. It is getting late and I must quit for the night. Now may our heavenly Father protect you and give you health and bring you home safe is the prayer of your Sister Mary E. Paschal. P.S., Please write soon. Good by for this time. Margaret & the children sends their love to you, except (accept) the same from your Sister Mary.